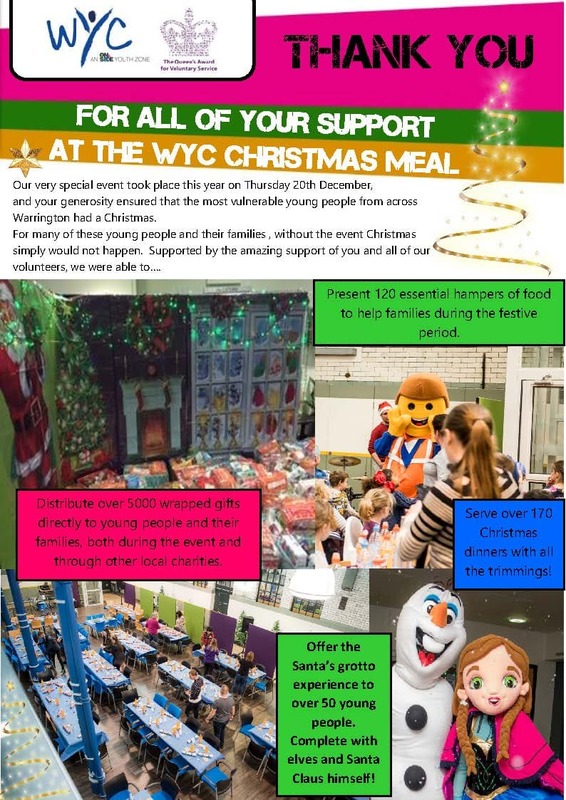 The Event that you supported helped out over 170 people and provided 120 food hampers to vulnerable families, I can’t tell you how much we appreciate your support for the life changing work we carry out with some of Warrington’s most vulnerable children, young people and families. Not only did you help to help to make this event a success, but the awareness driven locally about our charity is invaluable to the organisation. Here at Warrington Youth Club, our goal is to ‘inspire young people to achieve’ and through the kindness of people like your-self, we are able to carry out vital work and provide this event to families in order to achieve our goal. Through providing buddies and mentors to young people, personal development programmes to young women and young men and targeted support for young people with disabilities we can reach over 3500 young people every month. Once again, a huge thank you from all of us, I hope we can continue to count on your exceptional support for our upcoming fundraising events, if you would like to volunteer or discuss future events, I would love to hear from you!